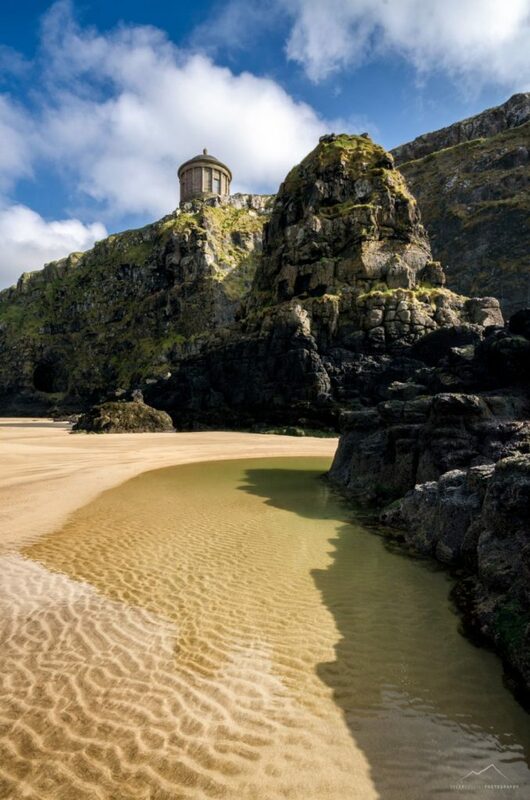 Mussenden Temple is one of those locations that if you haven’t photographed yet, then you really need to add it to your bucket list. I’m pretty sure that when I started my photography journey 5 years ago it was one of the first locations I shot, and 5 years later I still return to it on a regular basis. 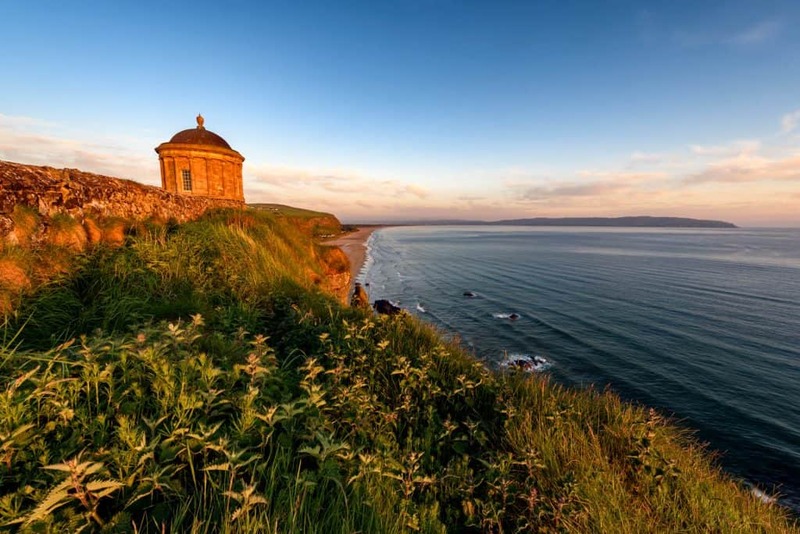 Mussenden Temple is located inside the Downhill Demesne Estate about 2 miles from Castlerock in County Londonderry. 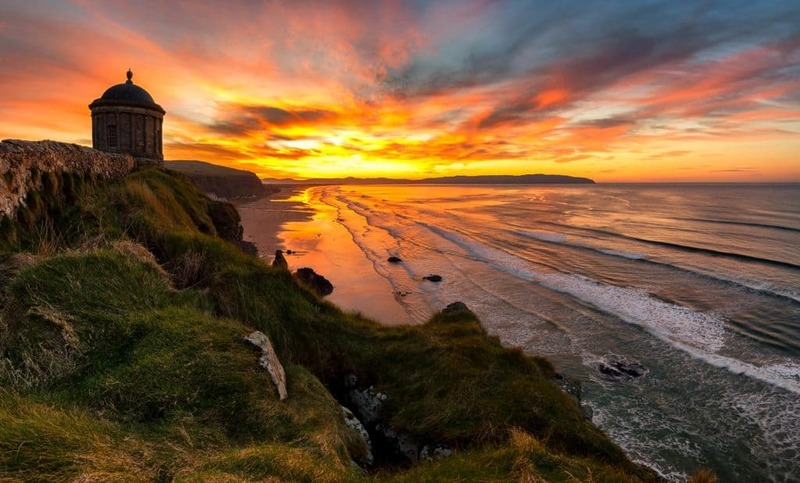 Perched on the edge of 120 foot sea cliffs above the Atlantic Ocean and with panoramic views of Downhill Strand, Benone Strand, Castlerock Strand, Portstewart Strand, Donegal, and on clear days Scotland – it is no wonder that the late Earl-Bishop built Mussenden Temple where it is today. I have indicated on the map below where you can park (Green P). The gates into the carpark are open 24/7 and parking is free when outside of their normal operating hours. It goes without saying that sunrise & sunset are the best times for any landscape photograph locations. With Mussenden Temple luckily because of its location it works as both a sunrise and sunset location at any time of the year. During the brighter months, around March – October it’s best to avoid it during the day as you’re just going to get those harsh shadows. From October – March, it’s a great location to shoot at anytime of the day. Personally during those months, when you’ve got one of those showery days with bright spells it works exceptionally well, you can go for some real dark moody images. 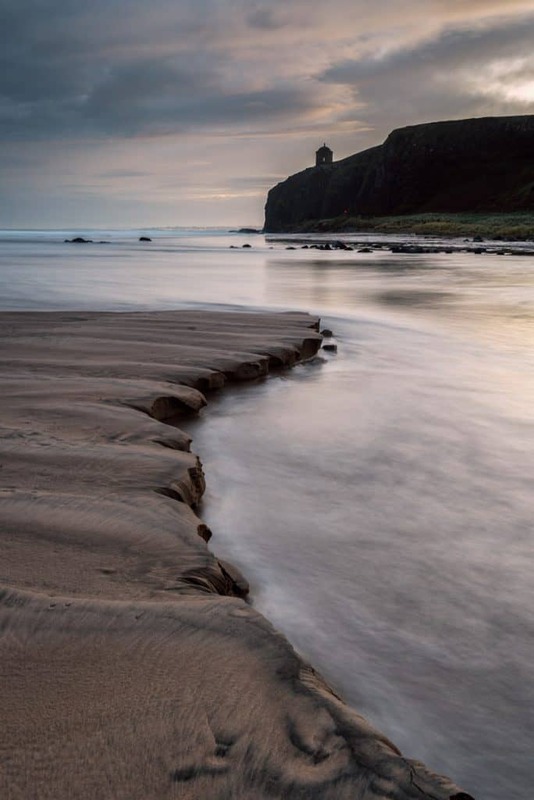 The thing about Mussenden Temple is that it’s a very popular location regardless if you’re a photographer or not. At sunset it can be very popular, I’ve been there and there has been maybe 20 other people there just enjoying the last of the sun before it sets behind the hills of Donegal. If you want to shoot the temple with no one else there then without doubt it’s best shot during sunrise while everyone else is in bed, that means setting your alarm for stupid o’clock. 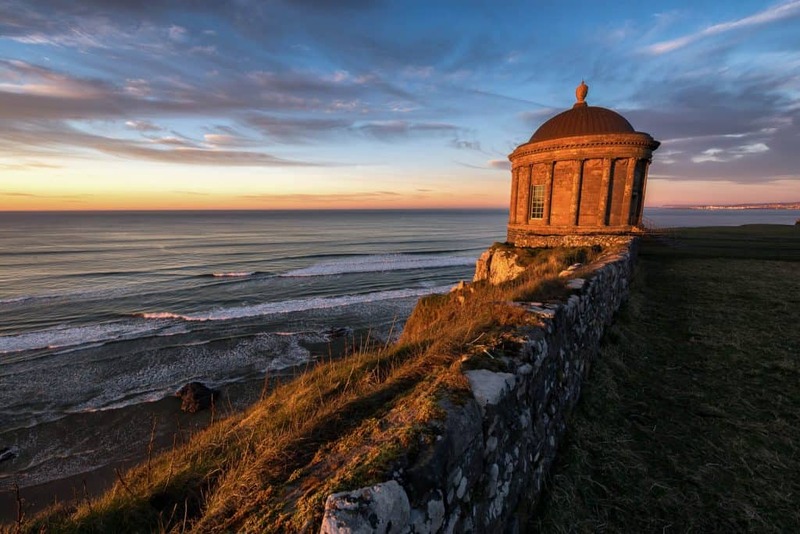 To sum up, Mussenden Temple can be photographed at any time of the year and day, whether that is sunrise, sunset or under the twinkling stars. Mussenden Temple basking in the warm light at sunrise. 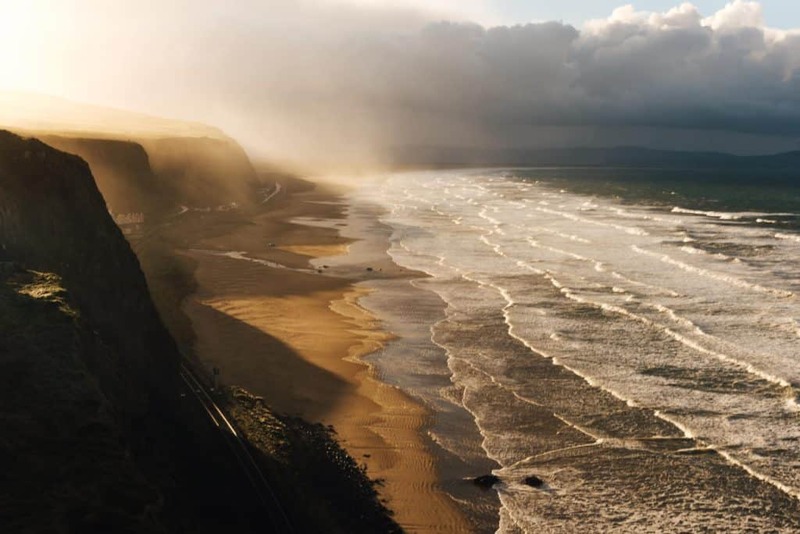 Downhill Beach as viewed from Mussenden Temple during a storm. 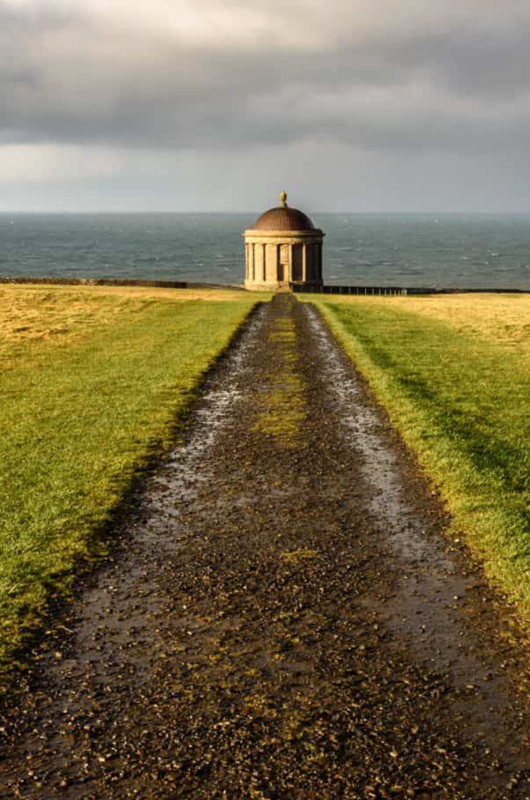 You are absolutely spoiled for choice when it comes to photographing Mussenden Temple! From using the path as a leading line down to the temple (below), to using the stone wall as another leading line towards the temple showing off those views across Downhill & Benone Strand towards the hills of Donegal (above) to shooting the temple from Downhill & Benone Strand, showing the temple perched high on top of those cliffs above the Atlantic Ocean (below). The second image below is one of those reasons as to why I love shooting the temple from Downhill Strand. Because of the ever changing tides shifting the sand, new compositions are coming and going. What could be there today could be gone again tomorrow. That particular feature on the beach was gone a few days later, gone forever! Not only is Mussenden Temple a great location for sunrise and sunset, but it’s also a great location for astro photography. 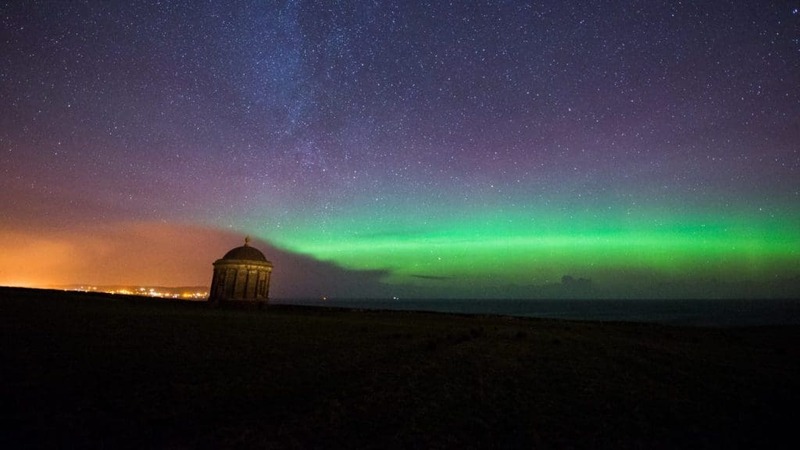 You do have some light pollution coming from the hills of Donegal to the east, and light pollution coming from Castlerock to the west, but looking out North you have nothing but horizon with no light pollution! A lot of people know I’m a veteren aurora chaser, having chased all around Northern Europe and having worked as an Aurora Guide in Arctic Finland, if I get a last minute aurora alert from twitter, Mussenden Temple is my go-to location with it only being 30 minutes down the road from me.